Yeah, that me…second from the right…the really short one! We’ve been in Ruhpolding for a little over 4 days now and its been amazing. The weather has been incredible, sunny every single day now. Where is my sunscreen!? Bavaria has been living up to my expectations. The people are friendly, the food is delicious, the coffee is bountiful, and the trails are amazing! Our first day here we went on long classic ski up to the base of an alpine area and around on the touring trails at the top. There is such an abundance of trails here, it is a dream come true! We skied around for two hours before grabbing a snack and skiing back down the valley to our van. The town is adorable with lovely little cobble stone streets and a dangerous supply of cafes and bakeries with outside seating and views of the mountains. This is what they mean when they say you’re “living the dream.” I definitely stick out as a waltz around town, thanks to our captain america jackets and my lack of german… it makes me really want to learn german (put another language on the list!) and as our amazing host at the brandstatter hof say, “Bavarian is very good speak!” I couldn’t agree more. We’ve skied at the venue a few times already and the place is astounding. 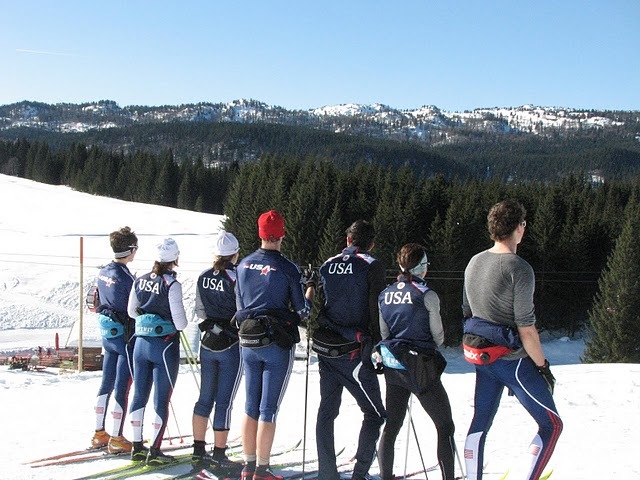 They’ve been working tremendously hard to get the trails ready for Biathlon World Championships that will take place here in March of 2012…and it is incredible! The stadium is incredible and the trails are both challenging and wonderful. The course doubles back on itself a lot so virtually everything you ski up you also ski down and they’ve gone big in both directions! …and just think I’ll be racing a german cup on the future world cup trails this weekend! The range is sheltered…that or we’ve just had some incredibly tame weather, but in training I’ve been shooting really well here. I understand why this place is such a biathlon mecca! We can ski out our front door and ski to really anywhere my heart desires…including other towns, talk about a good trail network. 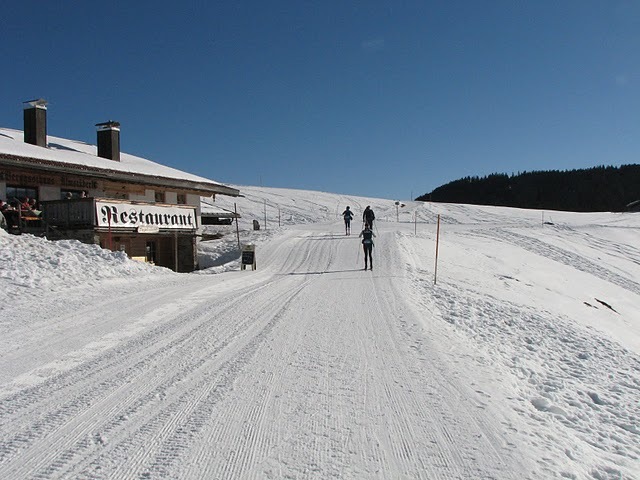 Every day I see couples and groups slowly meandering their way from place to place, classic touring around through sunny fields and all I think is, “Wow I could really get used to this life style!” A favorite seems to be the ski to the restraunt, or up the mountain to the beer… Germans really do have it all figured out. It looks beautiful. Drink lots of coffee and eat lots of pastries for me.